NETWORK FINALS: There were no changes from Sunday’s preliminary ratings. CABLE HIGHLIGHTS: AMC’s THE WALKING DEAD lost 0.11 to 1.66, and TALKING DEAD fell 0.21 to 0.50. Adult Swim’s HOT STREETS was at 0.34/0.31, compared to last week’s 0.34/0.29. On HBO, LAST WEEK TONIGHT dropped 0.09 to 0.26, THE CASE AGAINST ADNAN SYED dipped 0.06 to 0.15, and the season finale of the just-renewed HIGH MAINTENANCE was down 0.02 to 0.07 (also down 0.04 from the 2018 finale, on a Friday). On Showtime, the season premiere of BILLIONS was at 0.18 (down 0.08 from the 2018 premiere, and down 0.05 from last season’s finale), BLACK MONDAY was steady at 0.08, THE CIRCUS climbed 0.03 to 0.08, and SMILF ticked down to 0.06. 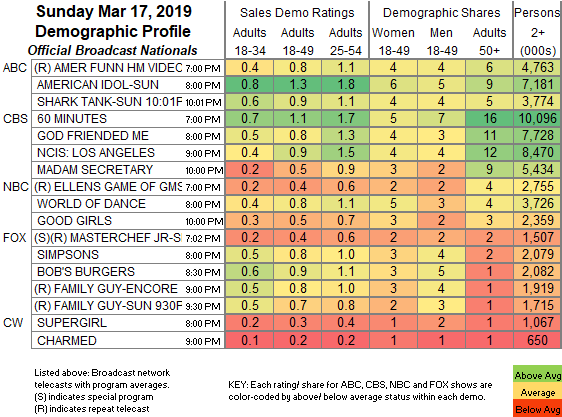 Starz’s AMERICAN GODS fell 0.05 from last week’s season premiere to 0.11, and we don’t have ratings for NOW APOCALYPSE, since we currently have no Sunday numbers below the Top 150. Unscripted was led by Bravo’s REAL HOUSEWIVES OF ATLANTA, down a tick to 0.77, with MARRIED TO MEDICINE down 0.02 to 0.34. ESPN’s SEC TOURNAMENT Finals game was at 0.61, with the AAC TOURNAMENT Finals at 0.35, and a primetime NBA game at 0.51. Food Network’s BUDDY VS. DUFF rose 0.06 to 0.49. On Discovery, NAKED & AFRAID was at 0.47/0.45, compared to last week’s 0.41, and ALASKAN BUSH PEOPLE was up 0.05 to 0.39. On TLC, SISTER WIVES edged up 0.02 to 0.37, and SEEKING SISTER WIFE was up 0.05 to 0.32. 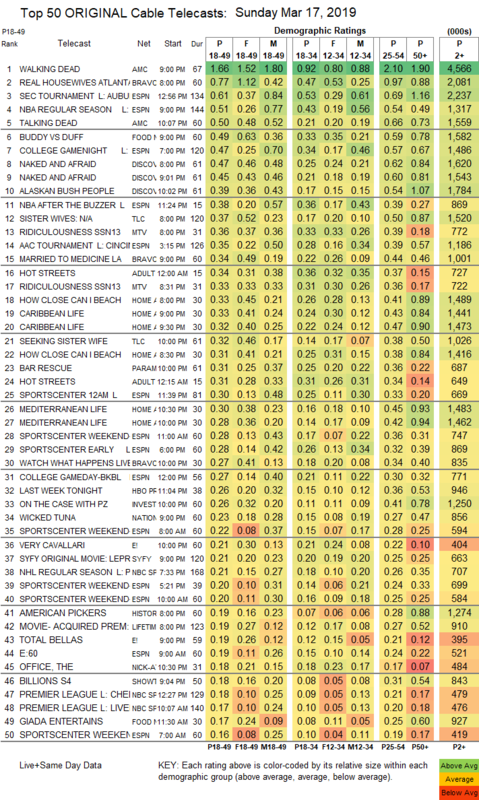 MTV’s RIDICULOUSNESS was at 0.36/0.33, compared to last week’s 0.35/0.32. HGTV’s line-up was led by HOW CLOSE CAN I BEACH at 0.33/0.31. Paramount’s BAR RESCUE climbed 0.03 to 0.31. On ID, ON THE CASE grew by 0.02 to 0.26. E!’s VERY CAVALLARI gained 0.02 to 0.21, and TOTAL BELLAS was down 0.05 to 0.19. History’s AMERICAN PICKERS lost 0.05 to 0.19.